Who loves to look at topiary trees? Who doesn’t love to pay the high price for them? ME! Some of my favorite bloggers use these topiaries around their home and I just loved the warmth they bring! 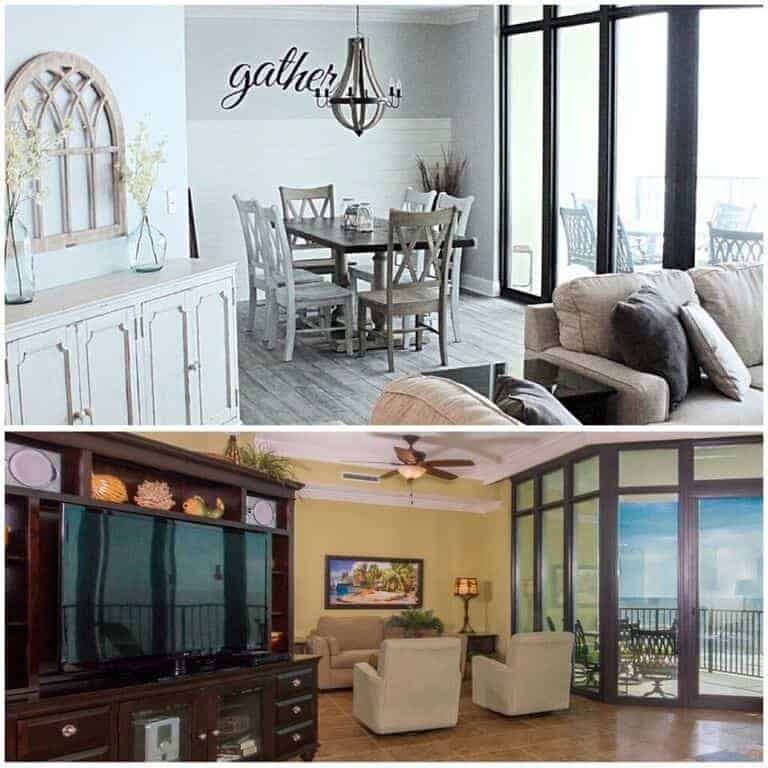 It looks like a great way to bring the outdoors in, even if they are fake. Could I make some of my own? Well guess what, you’re in for an easy budget friendly project friends. 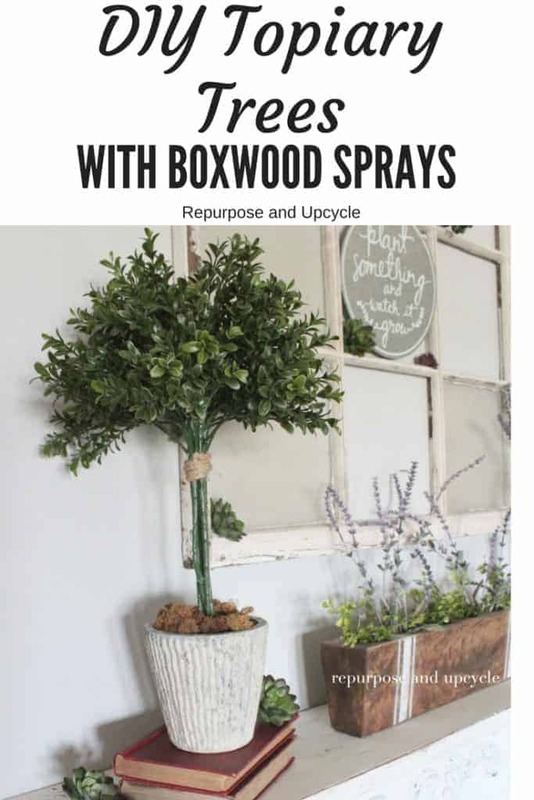 I can’t wait to share the easiest way to create DIY Topiary Trees with boxwood sprays. Enough of my walk down memory lane…. 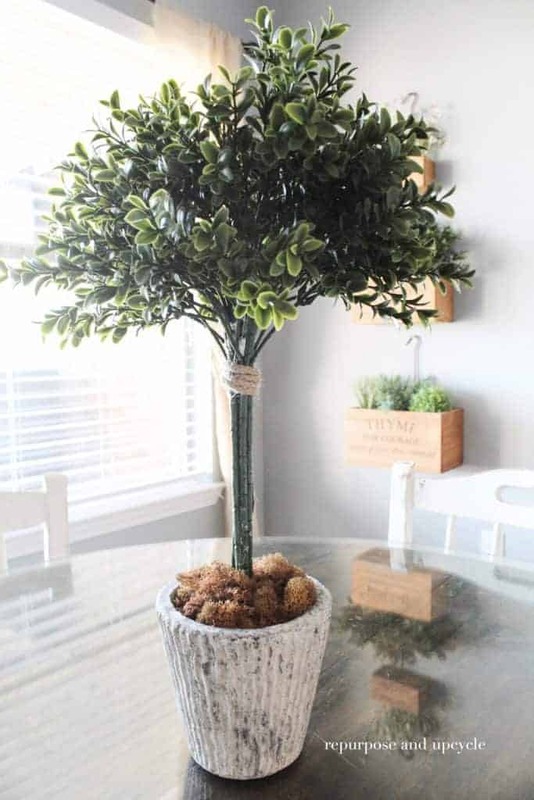 When I first thought of making these topiary trees I figured I would buy a floral foam ball and glue some sort of faux greenery to it and then attach it to a wooden dowel. That’s what I’ve seen most other crafters do at least. I knew there had to be an easier way to make topiary trees. That’s when I got the brilliant idea to clump five boxwood sprays together and create the “topiary tree” look. 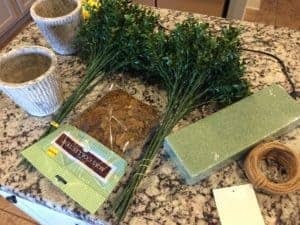 Below are the materials I used to create my own DIY topiary trees with boxwood sprays. A few of these links below are affiliate links. If you purchase from one of these links I will receive a small commission, but know that you will not pay any more for the product. This is a means to help this little blog to keep on chugging. 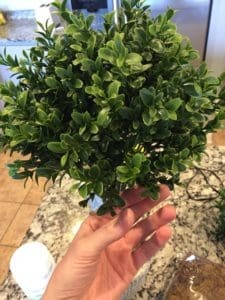 I’ve created a few “step by step” pictures of the process to make my topiary below. If you are a visual person like myself, you might enjoy my YouTube video more. Tell me, do y’all like these videos? Is it worth my time to continue doing them? I would love your feedback, just drop me a comment below. Ok, on with more of the step by step procedure pics. Below are my supplies. This is what it looked like below when I “clumped” the boxwood sprays together. Below is what the boxwood sprays looked like when I pushed them down into the floral foam. I used a rubber band at the bottom to keep them together. I decided to add a little yarn to the top of the boxwood to make sure individual sprays held together. The next step is to add the floral moss and that’s it! 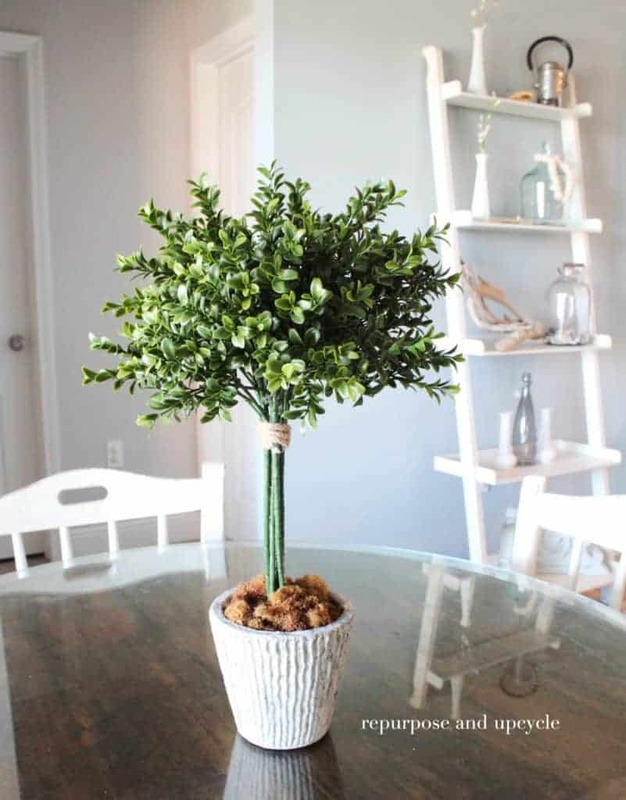 I love how a few simple DIY Topiary trees add lots of greenery and warmth around the house. What is it about a boxwood wreath or garland that gives a home that farmhouse vibe? I don’t know but I sure do love it! I think I enjoy my topiaries the best on my spring inspired mantel. 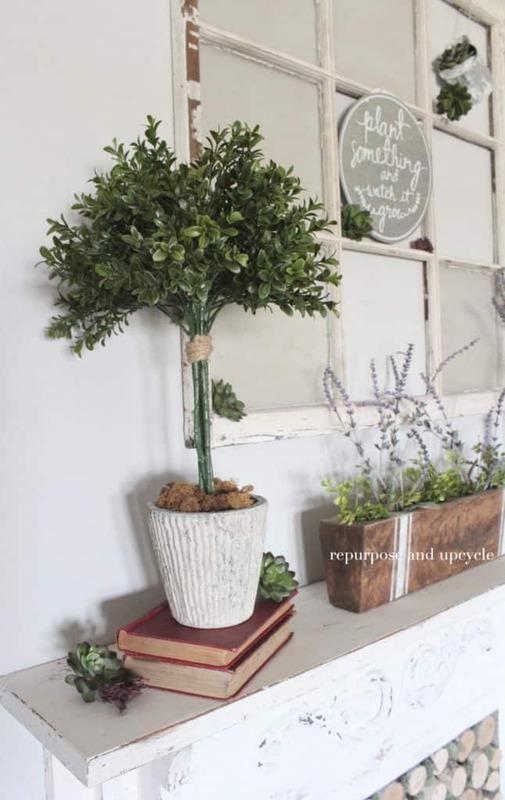 What is your favorite faux greenery or plant to decorate with? Did you enjoy this post? I would love for you to Pin the image below to Pinterest. If you enjoyed this post you, check out all my other budget friendly craft ideas! Your topiary is so cute and clever! Thank you so very much for linking to the Spring and Easter Joys party. Have a very Happy Easter! This looks so good and I know it would look great in my home. Thanks for sharing! Hi Lindsay! I am so happy you linked up over at The Spring and Easter Joys Link Party. I have featured your post this evening in my party highlight favorites. Happy Spring! Hi Lindsey I tried to leave a comment but I think I accidentally deleted! I wanted to let you know I have featured this post over on my blog tonight in my highlights post from the Spring and Easter Joys link party. I am so glad you came over and linked up! Happy Spring! This is such a great idea for a topiary! So pretty! Thank you for sharing at The Really Crafty Link Party. Pinned. Super cute, and I love low maintenance things! Thanks for sharing on To Grandma’s House We Go! 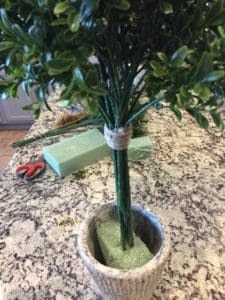 Loved this simple project because I love topiaries! You’ll be one of my features tomorrow from the Spring and Easter Joys link party; thanks for linking up! Thanks for the feature Lora and I hope you have a great weekend. What a great idea. They turned out darling!! Thanks for sharing with SYC. What a fabulous look. I would have had no idea that this little tree was a hack! 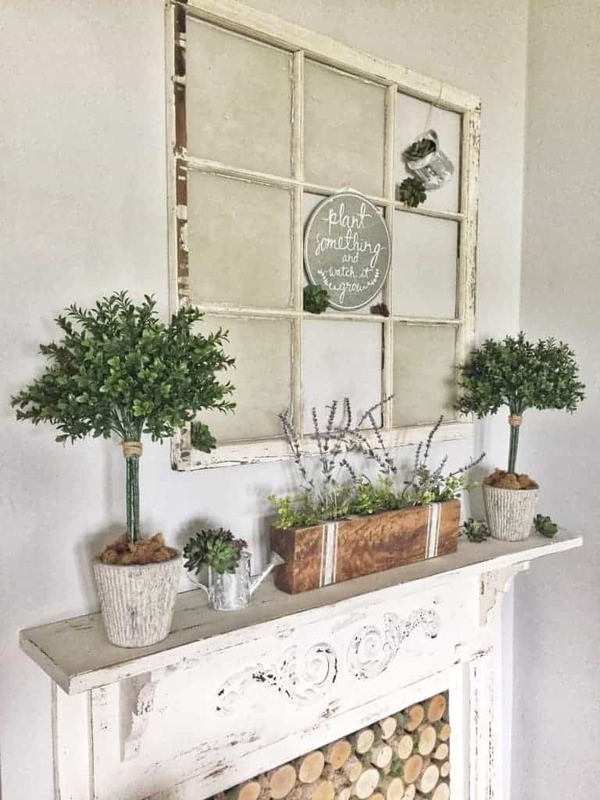 Your mantel is just lovely with all these pretty greens. I love this! What a great idea. I can’t wait to try it. I wanted to say Hi from the Saturday Sharefest! These sweet little trees would totally brighten up my house! Thanks for the lovely idea and for sharing it on Friday Frenzy! I love this idea, such a great look! Lindsey, this is an awesome project. Love the look and the instruction. Using the boxwood sprays was a great idea. Thanks for sharing at Happiness is Homemade. Pinning. 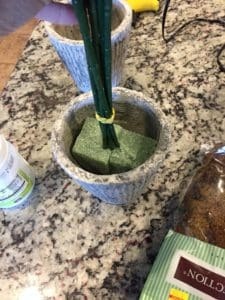 A wonderful DIY project for a furniture staging piece Lindsey, thanks for sharing it at #fridaysfurniturefix! 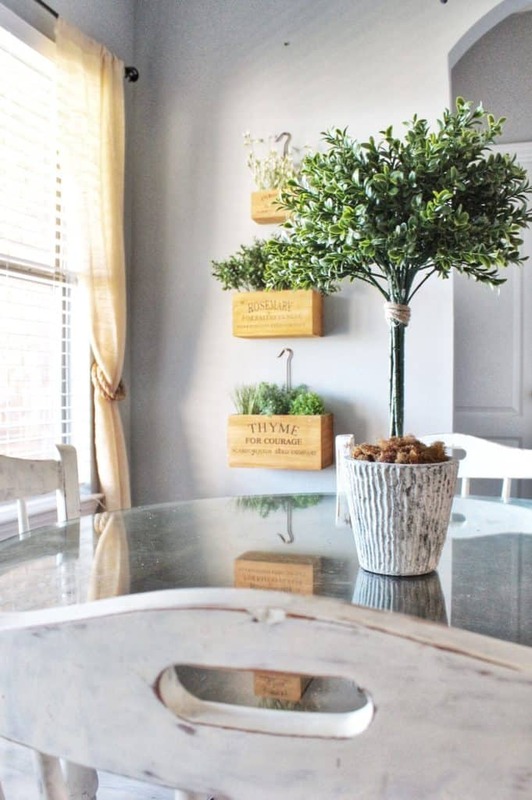 Your idea to make topiary trees with boxwood sprays is fantastic. 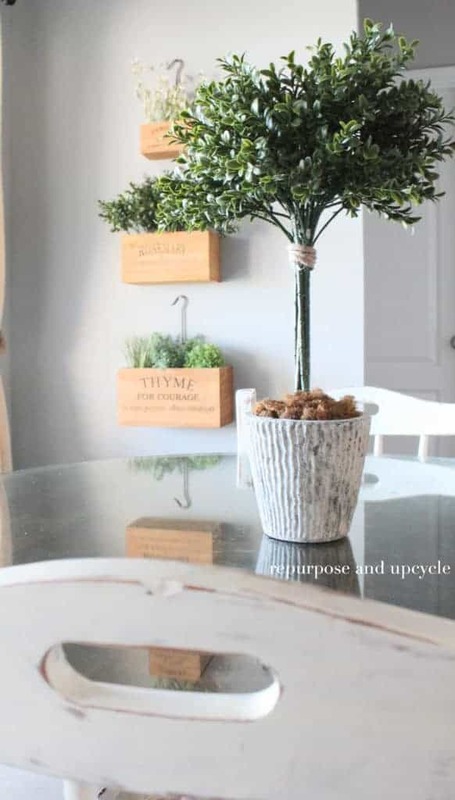 I love boxwood projects and I’m going to give this one a try too. Thank you for sharing at Snickerdoodle and look for your feature at my blog tomorrow. Great topiary project. Love your step by step and the video. Thank you Judy. I hope you have a lovely weekend.